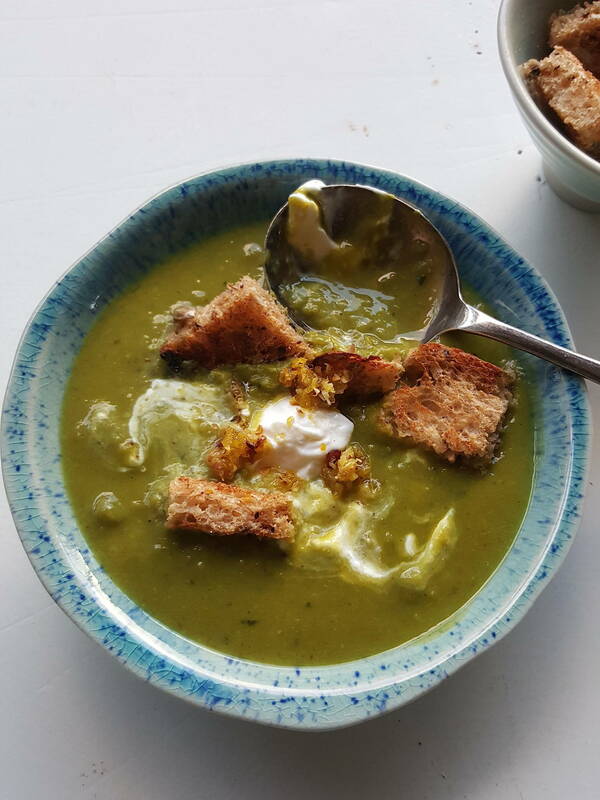 Layers of flavour are created quickly in this soup, but the crowning glory is the thick creamy yoghurt which melts into the soup and its sprinkle of spice. 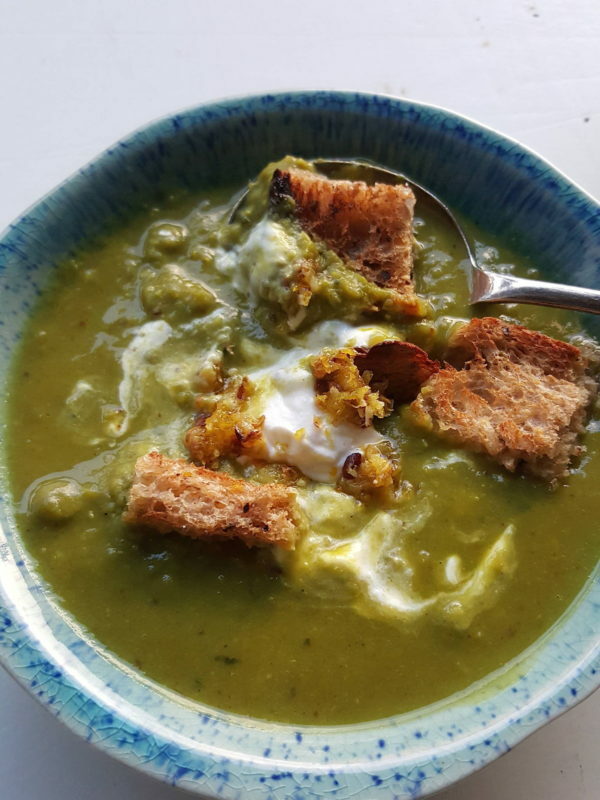 Perfect for cold nights, and quick to make, but, and this is what makes the soup interesting, a small snifter served in sweltering weather is also a winner. 1 Line a sieve with a piece of paper towel, set it over a bowl and pour in yoghurt. Leave to drain for 3-4 hours, until creamy and thick. 2 Put peas in a sieve and rinse with hot water until the icy crystals are washed off. 3 Put onion and ginger in a saucepan with butter and 1 teaspoon water. Cover with a lid and cook gently, for 7-10 minutes, until softened and lightly coloured; keep heat gentle or it will taste harsh. Add salt, turmeric, cumin and chilli powder. Cook through for 30 seconds, then add peas and stock. Bring to a gentle boil, then lower heat and cook gently for 30 minutes, partially covered with a lid. 4 When soup is ready, remove lid and leave it to cool for 10 minutes. Blend in a liquidizer or food processor with mint, blending most of the solid matter first, then adding as much liquid as necessary to bring it to a soup-like consistency. Taste and adjust seasoning if necessary. Return to cleaned pan and reheat. 4 To make the spicy sprinkle, sizzle ingredients in butter for 2-3 minutes. Spoon soup into cups or bowls and add blobs of drained yogurt. Put a dollop of sizzled spice mixture on top of each and serve immediately. 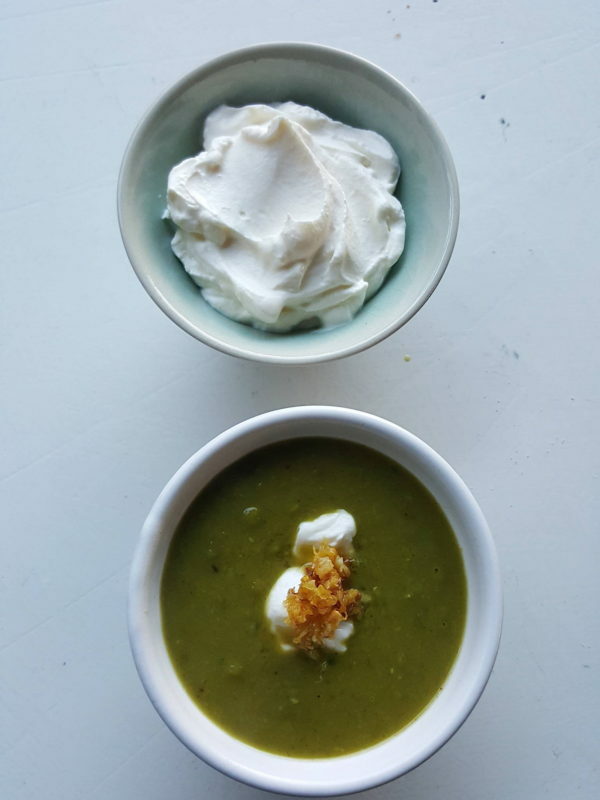 Serve small bowls or cups of pea soup in summer – the spices will warm you up, make you sweat, and as the sweat evaporates, you’ll cool down. True! A great soup!! Easy and So delicious. Thanks Jacque. I love it because it is great any time of year. And it’s cheap!